Gluten and dairy free, this healthy and tasty meal is quick and easy to assemble. It’s an ideal make-ahead meal, which can be ready to put on to cook when you get in from your day. Preheat the oven to 200°C/gas mark 6 or set a large steamer pan on to boil on the hob. Place the noodles in a wide, shallow bowl or baking dish and pour over enough just-boiled water to cover. Leave to soak for about 3 minutes, until bendable but not cooked through. Drain the noodles well and return to the bowl. Add the peas, spring onions, chilli (if using) and ginger. Divide the noodle mixture evenly between four large squares of parchment paper. Sit a salmon fillet on top, followed by 1 tablespoon of soy sauce over each one. 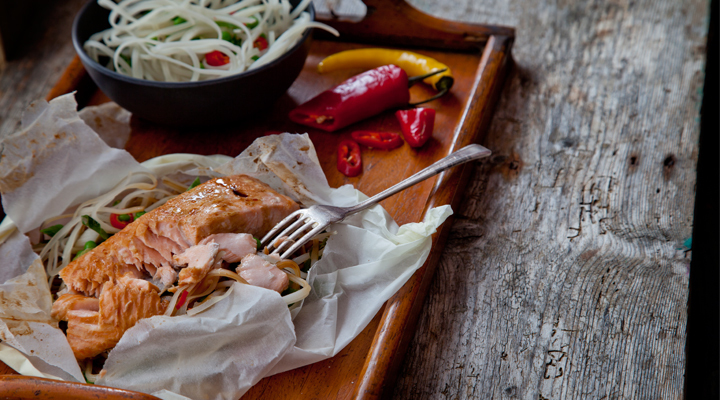 Gather the edges of parchment paper up over the salmon, scrunching them together to enclose securely. These can be prepared to this stage up to a day in advance and kept refrigerated. If being frozen, make sure you defrost them thoroughly before cooking. Pop the parcels on a baking tray if baking in the oven or into the steamer tray covered with the lid if cooking on the hob. Cook for 15 to 20 minutes, until cooked through. Place a parcel on each serving plate with a lime wedge and allow everyone to open their surprise meal themselves. For a spicier version, spread 1 teaspoon of your favourite Thai curry paste on top of each piece of salmon before cooking. A tablespoon of coconut milk would work wonderfully in each parcel. Experiment with other vegetables like chopped bok choy, spinach or broccoli florets. Replace the salmon with a piece of cod or a chicken breast.